Takotsubo cardiomyopathy (TTC) is a temporary condition that results due to sudden weakening of the heart muscle and change in the shape of the left ventricle. The left ventricle changes its shape developing a narrow neck and a round bottom, hence the name Takotsubo, which means "octopus pot" in Japanese. Other synonyms are stress-induced cardiomyopathy, broken-heart syndrome, and apical ballooning syndrome. Although the etiological mechanism of TTC remains unclear, a dramatic increase in catecholamines, such as epinephrine and norepinephrine, has been recognized as a possible cause. Selective serotonin-norepinephrine reuptake inhibitors (SNRI) such as venlafaxine, desvenlafaxine, and duloxetine inhibit reuptake of serotonin and norepinephrine at presynaptic level and increase their level at postsynaptic level, predisposing the patients to iatrogenic catecholamine excess. We report a case of TTC following normal dosing of venlafaxine, and review all the cases reported of TTC associated with SNRI use. A 52-year-old Hispanic female presented to the Emergency Room with complain of left-sided chest pain radiating to her left arm associated with nausea but no vomiting. According to the patient, the pain began 2 hours before presentation when she was having breakfast; she reported no previous similar episodes. She did not recall any change in her daily routine and had no stress at work or home. Her past medical history included hypertension, for which she was taking enalapril 2.5 mg, and chronic back pain secondary to disc budge at L4-L5 level, for which she was taking oxycodone. She never had any cardiac catheterization or echocardiography done in past. She had no known drug or food allergies. She was recently started on venlafaxine 75 mg for her depression 4 weeks ago. Upon arrival to the Emergency Department, her blood pressure was 128/85 with a pulse of 94 beats per minute. The physical examination including cardiovascular examination was essentially normal. Electrocardiography done in the emergency department showed sinus tachycardia with rate of 118/min with no ST segment changes but diffuse symmetric T-wave inversions in the limb and precordial leads [Figure 1]. Patient was given Asprin (ASA) 325 mg, plavix loading dose of 600 mg, and nitroglycerin with some improvement in chest pain. Her cardiac biomarkers were increased at 1.85 ng/ml. Patient was diagnosed with non-ST elevation myocardial infarction, admitted to telemetry floor, and started on heparin drip. Her chest pain improved overnight and troponins in morning were 1.7 ng/ml, with normal complete blood count and metabolic profile. 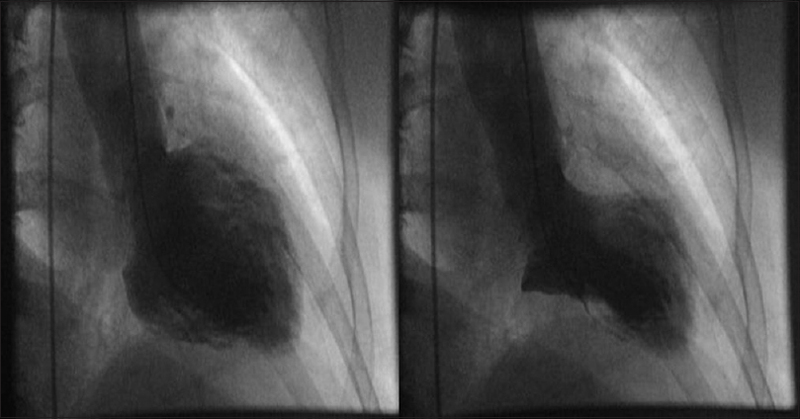 Patient was taken for cardiac catheterization, which showed normal coronaries [Figure 2], with left ventriculogram in right anterior oblique projection showing diffuse dyskinesis/ballooning of the left ventricular apex (both anterior and inferior aspects) and ejection fraction of 45% [[Figure 3] panel A/B]. 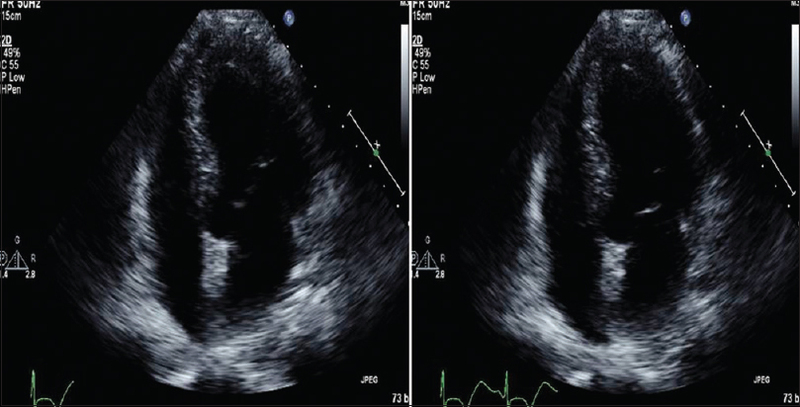 Echocardiography was also done that showed hyperkinesia of the basal segment of the left ventricle with akinesis and ballooning of the apical segment of the left ventricle, with ejection consistent with the morphology of TTC [[Figure 4] panel A/B]. Patient was diagnosed to have TTC secondary to SNRI venlafaxine. She was discharged home on ASA, enalapril, and metoprolol, and was asked to discontinue venlafaxine therapy. Follow-up echocardiography after 6 weeks showed complete resolution of wall motion abnormalities and normal ejection fraction. TTC was first reported in 1990, and since then many cases have been reported and various theories have been put forward to explain its pathophysiology. TTC is characterized by reversible left ventricular dysfunction due to akinesia/hypokinesia involving the apical/mid-ventricular segments and a hyperactive base (causing left ventricular outflow obstruction). Patients usually present with chest pain, dyspnea, and syncope. 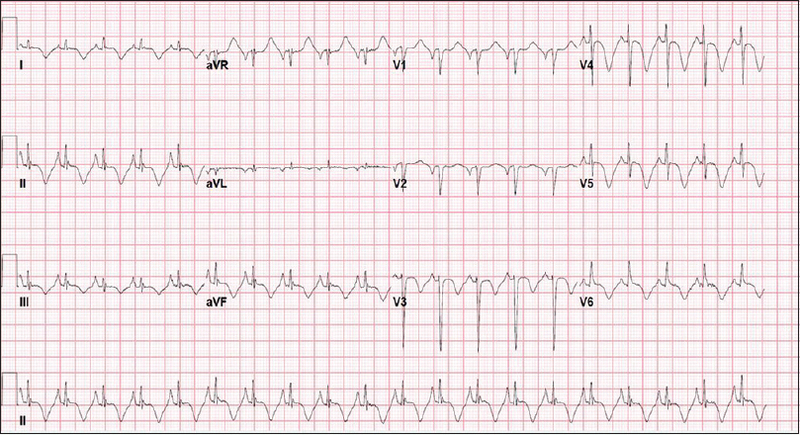 They may have ST segment/T-wave changes with modest elevation of troponins. Diagnosis is confirmed with an echocardiography showing regional wall abnormalities that extend beyond a single epicardial coronary artery distribution and cardiac catheterization showing absence of obstructive coronary disease or angiographic evidence of acute plaque rupture. With conservative management and supportive treatment, most of the cases show recovery of left ventricular systolic function in 1-4 weeks. In our literature search on PubMed with "SNRI and Takotsubo" and "venlafaxine and Takotsubo" as keywords, we could identify 8 more cases of TTC (2 case reports , and 1 case series  with 6 patients). Demographic, clinical characteristic, laboratory characteristics, and imaging findings of all the patients including our case are summarized in [Table 1]. Seven out of 9 patients were taking venlafaxine, one patient was on desvenlafaxine and another patient was on duloxetine when they developed TTC. Most of these patients were taking prescribed doses of SNRIs (n = 7) whereas two patients had suffered an overdose of venlafaxine. Eight of the 9 patients were females with mean age of 57.2 years (range 37-82 years). All of the patients showed segmental left ventricular dysfunction with ejection fraction ranging from 25-60%, and all of them showed complete recovery of wall motion abnormalities. Eight out of the 9 patients had elevated troponins on admission (0.10-2.88 ng/ml). These findings support the theory of apical ballooning caused by catecholamine-induced myocardial stunning. These patients had elevated serotonin/norepinephrine levels secondary to reuptake inhibition leading to TTC. We would emphasize the importance of selectively choosing SNRIs in patients at risk of TTC. If diagnosed, SNRIs should be stopped and alternate antidepressants should be tried. Moreover, independent trials evaluating the cardiotoxicity associated with these newer highly selective serotine/norepinephrine reuptake inhibitors are required. Bybee KA, Kara T, Prasad A, Lerman A, Barsness GW, Wright RS, et al. Systematic review: Transient left ventricular apical ballooning: A syndrome that mimics ST-segment elevation myocardial infarction. Ann Intern Med 2004;141:858-65. Wittstein IS, Thiemann DR, Lima JA, Baughman KL, Schulman SP, Gerstenblith G, et al. Neurohumoral features of myocardial stunning due to sudden emotional stress. N Engl J Med 2005;352:539-48. Paur H, Wright PT, Sikkel MB, Tranter MH, Mansfield C, O'Gara P, et al. High levels of circulating epinephrine trigger apical cardiodepression in aβ2-adrenergic receptor/Gi-dependent manner: A new model of Takotsubo cardiomyopathy. Circulation 2012;126:697-706. Ueyama T, Kasamatsu K, Hano T, Yamamoto K, Tsuruo Y, Nishio I. Emotional stress induces transient left ventricular hypocontraction in the rat via activation of cardiac adrenoceptors: A possible animal model of 'tako-tsubo' cardiomyopathy. Circ J 2002;66:712-3. Kurisu S, Sato H, Kawagoe T, Ishihara M, Shimatani Y, Nishioka K, et al. Tako-tsubo-like left ventricular dysfunction with ST-segment elevation: A novel cardiac syndrome mimicking acute myocardial infarction. Am Heart J 2002;143:448-55. Akashi YJ, Nakazawa K, Sakakibara M, Miyake F, Koike H, Sasaka K. The clinical features of takotsubo cardiomyopathy. QJM 2003;96:563-73. Moreo A, De Chiara B, Possa M, Sara R, Bossi I, Orrego PS, et al. Functional derangement and cardiac innervation in the apical ballooning syndrome: A 123 I-meta-iodobenzylguanidine scintigraphic and dobutamine stress echocardiographic study. J Cardiovasc Med 2007;8:205-9. 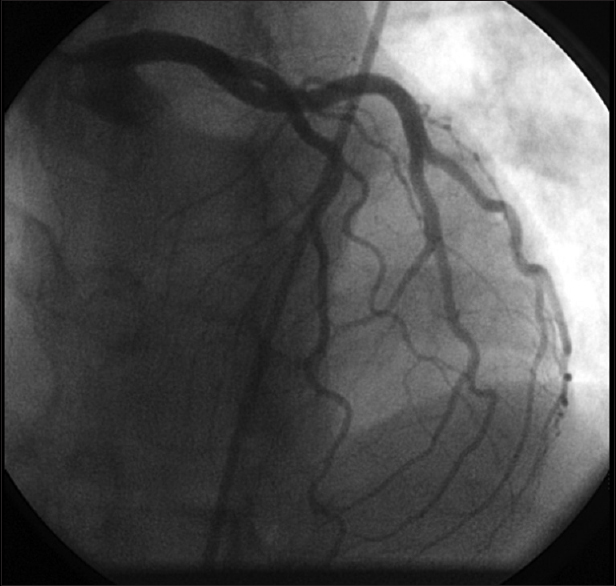 Bergman BR, Reynolds HR, Skolnick AH, Castillo D. A case of apical ballooning cardiomyopathy associated with duloxetine. Ann Intern Med 2008;149:218-9. Christoph M, Ebner B, Stolte D, Ibrahim K, Kolschmann S, Strasser RH, et al. Broken heart syndrome: Tako Tsubo cardiomyopathy associated with an overdose of the serotonin-norepinephrine reuptake inhibitor Venlafaxine. Eur Neuropsychopharmacol 2010;20:594-7. Howell C, Wilson AD, Waring WS. Cardiovascular toxicity due to venlafaxine poisoning in adults: A review of 235 consecutive cases. Br J Clin Pharmacol 2007;64:192-7. Charniot JC Vignat N, Monsuez JJ, Kidouche R, Avramova B, Artigou JY, et al. Cardiogenic shock associated with reversible dilated cardiomyopathy during therapy with regular doses of venlafaxine. Am J Emerg Med 2010;28:256.e1-6. Ziegelstein RC. Depression and tako-tsubo cardiomyopathy. Am J Cardiol 2010;105:281-2. Selke KJ, Dhar G, Cohn JM. Takotsubo cardiomyopathy associated with titration of duloxetine. Tex Heart Inst J 2011;38:573-6. Neil CJ, Chong CR, Nguyen TH, Horowitz JD. Occurrence of Tako-Tsubo cardiomyopathy in association with ingestion of serotonin/noradrenaline reuptake inhibitors. Heart Lung Circ 2012;21:203-5. 5 Venlafaxine and takotsubo syndrome: Can we learn more from published patient cases?